At long last, I am ready to reveal my first musical collection! I have had so much fun creating this line and hope you enjoy it as much as I do. 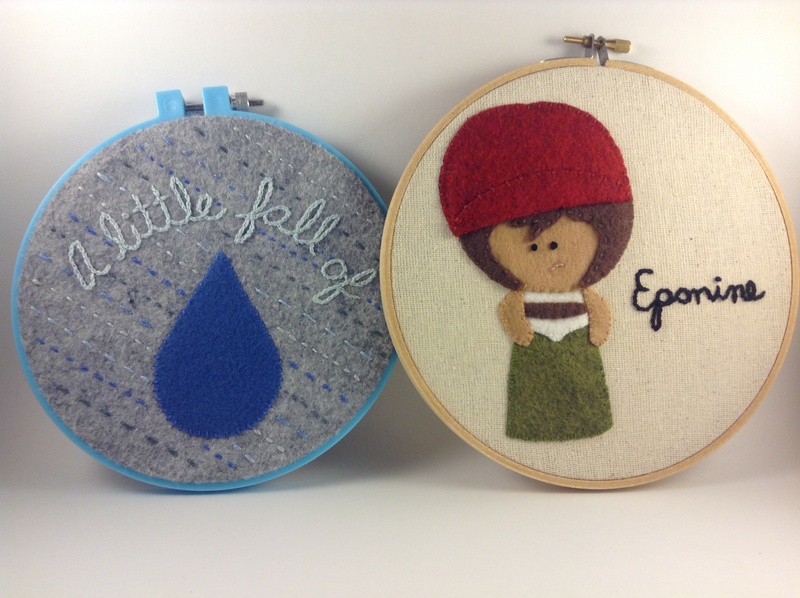 We will start our introduction to the Les Mis felties with sweet, sad, love-struck Eponine. She is my favorite character; I think that this is largely in part to the fact that both Lea Salonga and Samantha Barks have played Eponine on the stage (and film) flawlessly. Do yourself a favor, watch both clips below and judge for yourself who played the better Eponine. (There is no wrong answer here!). While I love, love, love Lea (and have met her twice), I am inclined to say that I prefer Samantha a tad more when it comes to the Eponine role. Eponine’s two highlighted songs are On My Own and A Little Fall of Rain; I spared you and am sharing the Lea Salonga/Michael Ball version of the later as the only Youtube clip of Samantha I could find was with Nick Jonas and I do not want your ears to start bleeding! Now have a listen. Who did you prefer? Tough choice, right? As you can see, my little felt Eponine’s garmet choice mirrors the stage (not the film) costume. I would have loved to make her a tiny felt trench coat, but that didn’t happen, perhaps for the next go around. 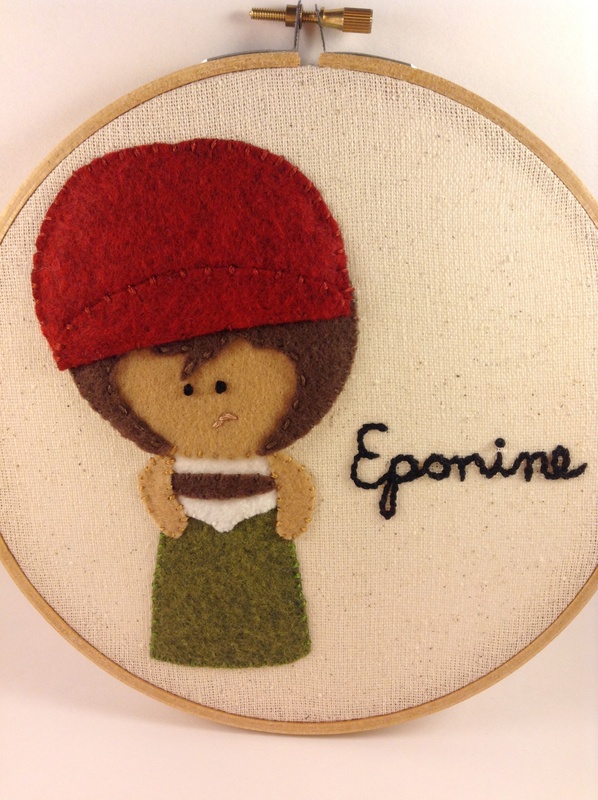 For now our little Eponine is housed in a 7″ wood hoop wearing a hat, bodice, belt, skirt, and a frown as she, of course, is mulling over the fact that she will never have her beloved Marius. Oh, so tragic! At least she is gifted a glimpse of happiness as she dies in the arms of her beloved while singing A Little Fall of Rain. This was actually the starting point for my Les Mis collection; I made this one way back in November. 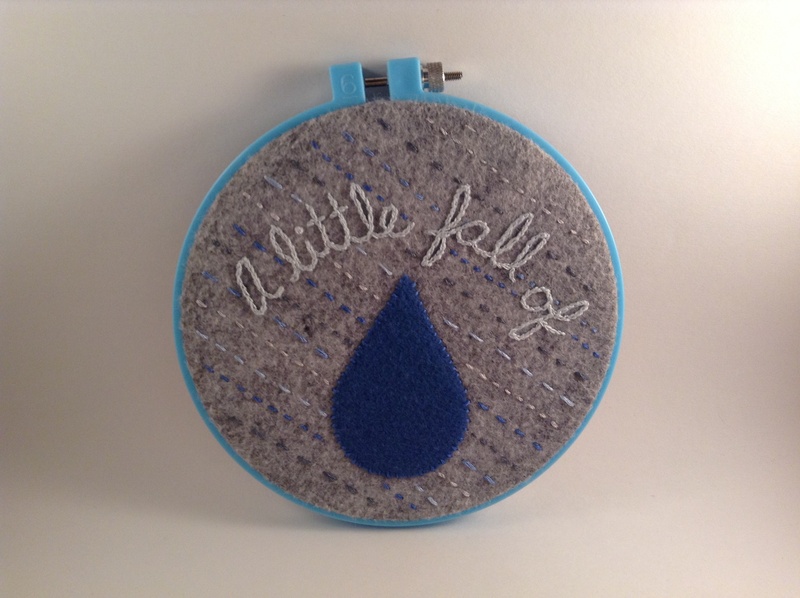 I used around 8 different shades of blue and grey and many, many running stitches to create my “rainfall” effect. Do you like? This 7″ hoop is felt on felt and I love the feel!